The national exit poll showed on Sunday that Ukrainian actor Volodymyr Zelensky and incumbent President Petro Poroshenko gained the largest number of votes in the first round of the country's presidential election and make it to the run-off, the Ukrainian government-run Ukrinform news agency said. The exit poll conducted by the Ilko Kucheriv Democratic Initiatives Foundation suggested that Zelensky is taking a lead in the presidential race by garnering 30.4 percent of the votes as of 06:00 p.m. local time (1500 GMT), while Poroshenko is the runner-up with 17.8 percent of the votes. According to the Ukrainian law, if none of the 39 candidates gets more than half of the votes in the first round, the two candidates with the most ballots are heading to a run-off on April 21. 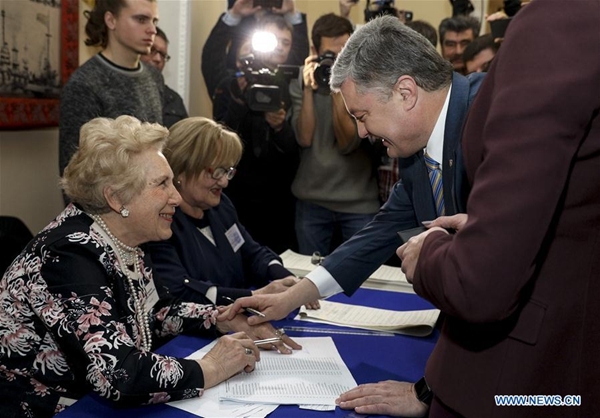 Voting for the presidential election in Ukraine kicked off at 08:00 a.m. local time (0500 GMT) and ended at 08:00 p.m. (1700 GMT). The national exit poll showed on Sunday that Ukrainian actor Volodymyr Zelensky and incumbent President Petro Poroshenko gained the largest number of votes in the first round of the country's presidential election and make it to the run-off.